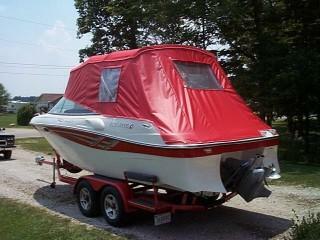 Here is the latest "bimini" top with camper package. 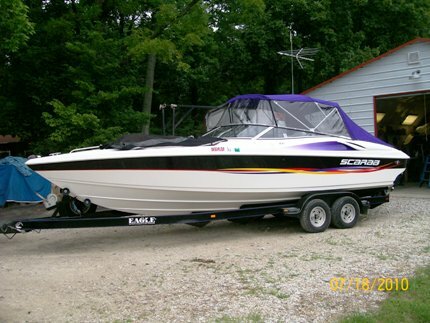 A perfect compliment to this go-fast boat. 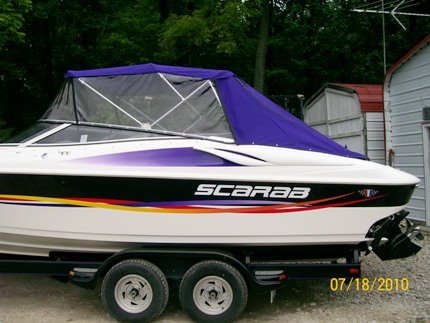 Purple "Sunbrella" on a beautifull 1998 twenty-seven foot Wellcraft Scarab. 3 bow, custom bent 7/8" dia. aluminum frame, chrome fittings, stand-up struts, and beefy "YKK" #10 zippers. 20 guage clear vinyl offers plenty of visibility, with a appropriate sized zip-up aft window and bug screen. Nice zip-up aft/port entry. 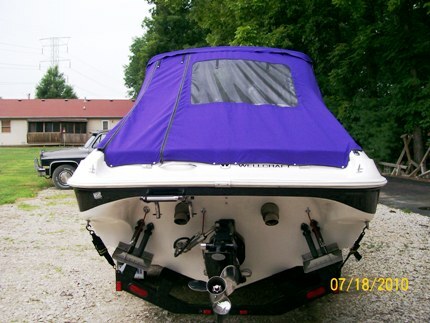 I can fabricate the enclosure from your existing bimini top frame and fittings or complete one from scratch including the bimini or convertible top. 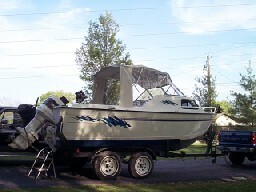 I ask all customers to take some time and think about how they envision using a camper package on their boat if they havn't done so already. Some choose more privacy, some choose more visibility or a nice balance of both. Zip-up windows and bug screen will add to the expense, but, are essential for ventilation if you plan on overnighting on the boat. Your camper package may only be intended for you to escape severe weather reducing the need for alot of ventilation. These examples are stand up models and feature no-seeum bug screen and zippered clear 20/20, 40 mil vinyl windows. Your preference on the size of windows and material (either clear vinyl or fabric curtains or both) depending on desired privacy. 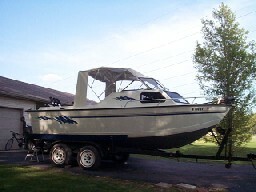 Plenty of visiblity for this double hulled aluminum fishing boat. 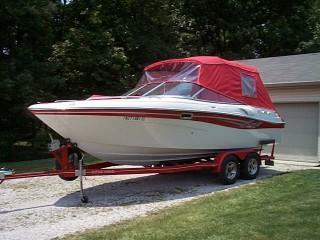 Custom made standup, 3 bow, bimini top that snaps to the windshield frame. Port and starboard side curtains will do a nice job keeping this captain out of the weather. Built to last with heavy "Harbor Time" marine fabric. 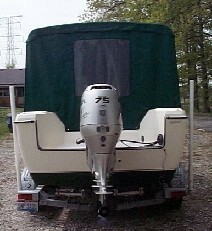 The canvas forward of the radar arch is actually part of the bimini top. My customer chose this design and I wish I would have taken a picture without the enclosure curtains. 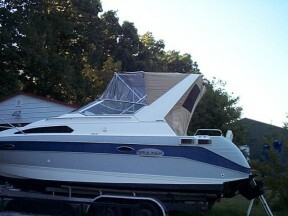 It really gives the boat a cool effect. Please check out the aft deck upholstery on my upholstery page.